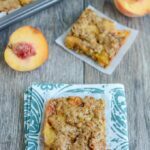 This recipe for Ginger Peach Oat Bars is perfect for a summer dessert. They’re packed with fresh, juicy peaches and taste great topped with a scoop of vanilla ice cream! Combine melted butter, brown sugar, egg, cinnamon, ginger, vanilla and peanut butter in a large bowl and mix well. Stir in diced peaches and stir to combine. Add flour, oats and baking soda and stir gently until combined. Scoop into a 9×9 pan lined with parchment paper. Bars will be moist and slightly crumbly. They will firm up slightly once cooled completely but are best eaten in a dish with a spoon or fork.